CMLTO Annual Registration Renewal is required of all members of the medical laboratory technology profession in Ontario. 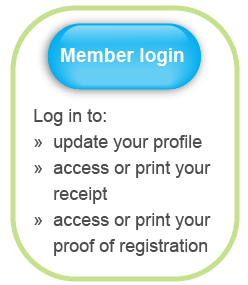 Membership renewal must be completed using the online process. For information about fees, go to this page. The Annual Registration Renewal notice is mailed annually in the second week of October. CMLTO's Annual Registration Renewal for 2019 begins on November 1, 2018. All medical laboratory technologists registered in Ontario must renew their CMLTO registration online by December 31, 2018. Log in using your User Name (your CMLTO registration number) and your current User Password. If you have forgotten your password, you may reset it by typing “forgot” and then click the ‘Login’ button. On the following page, select “Click Here to Reset your Password.” This will reset your password to your date of birth, which must be entered in the following format: yyyy/MMM/dd. For example: 1972/SEP/08. Complete all sections of the renewal process. This year, all Practising members will be required to verify their employment information, and update as required, in order to complete the renewal process. Select a payment option, remit the annual fee, and submit your renewal. Payment must be confirmed to complete your renewal. Members may pay with Visa, MasterCard, or Interac. If you are using a Visa-Debit card, you must select the "pay by credit card” option in order for your payment to be processed. Members may not pay by cheque. CMLTO cannot accept payments made through your bank, i.e., in-person banking, online banking, e-transfers. Print your tax receipt/proof of registration. Beginning on November 1, 2018, you may resign your CMLTO membership for 2019. Your resignation will become effective on January 1, 2019. Log in to www.cmlto-onlineservices.com as described above. Under the Class of Registration tab, select the “Resign” option. You will be asked to confirm your decision and your reason for resigning. Retirement from employment does not disqualify a member from maintaining registration with CMLTO. All CMLTO members who hold a Practising certificate of registration must fulfill their professional obligations regardless of their employment status, including meeting the CMLTO Quality Assurance Program (QAP) requirements. Once a member resigns from CMLTO, the member may not legally use the protected title “medical laboratory technologist” in Ontario.